In only a few days I couldn’t sample everything that Austin has to offer so had to whittle down my wishlist to spots without significant waiting times - if you’ve come for pics and rhapsodic prose on Franklin’s I apologise but hopefully still won't disappoint. For a successful food trip, you should choose where to stay wisely. I highly recommend the area around East 6th, where I rented a loft via VRBO. You’ll be walking distance (clearly anathema to most Americans and I can kind of understand when it’s so damn hot) from most of the places I list here. The area also has a great relaxed vibe with loads of bars and live music, but you're also a quick cab ride from downtown or the gorgeous Barton Springs when you need to cool off. Let’s start with Barbecue. It’s what this part of Texas is known for. I saw an Instagram pic of the juicy ribs at Franklins and the pit at Salt Lick and knew that one day I would come to Austin. I have to admit though that in baking 37-degree heat (Celsius, or a whisper away from 100F), a huge mound of meat loses its appeal. Sorry but it’s true. Anyway, I persevered and was able to check out a couple of great spots. An Instagram friend raved about John Mueller, so it was high on my eat list. We arrived shortly after opening to no queue and were not disappointed. A huge slab of beef ribs appeared, and one was carved off for us. A hunk of brisket to sample convinced us to order a few slices too. The ribs were truly glorious. The meat slid cleanly from the bone and there was a depth of flavor I didn’t get elsewhere. The brisket was slightly tough in spots, but didn’t detract from the flavor. Maybe because it was our first stop, but I liked John Mueller a lot. Timing is everything. We arrived at John Mueller shortly after opening and didn’t queue at all. After that early feast, we didn’t manage to get to La Barbecue until around 1pm. An hour and three quarters later we got to the front of the queue to find that they had sold out of ribs, sausages and some sides leaving just chopped brisket and pulled pork. At least it made the choice easy. We had a (literal) handful of each, but after standing in the heat so long, I wasn’t really in the mood for a meatfest. Still, the pulled pork was truly some of the best I’ve eaten, but I thought the chopped brisket was a little on the salty side for my taste buds. Of the sides, I loved the pinto beans, and the slaw was good but not great. I think because we missed out on some of the classics like the ribs and sausages I didn't get the full La Barbecue experience. Time was short though, so there was no possibility of a repeat visit. Salt Lick is probably the most famous BBQ in the area. It’s been featured on countless TV shows (Man V Food) and the pit, cunningly positioned in full view as you enter, is worth the 30 min drive from Austin. But…but…I didn’t love the food. The style is different to the other BBQ I tried. Salt Lick is a saucier affair and the meat is basted with a slightly-too-sweet-for-me concoction. We chose tasting plates which come with various sides and give you an opportunity to sample a bit more. It was a sloppy presentation, but I enjoyed the tender pork ribs and sausage while the brisket was okay. The sides weren't particularly memorable. After the glorious beef ribs at John Mueller, the ones at Salt Lick were almost inedible. The meat was tough and sinewy. Even my expert gnawing, honed over the years on lamb chops, could barely scrape the meat away. Given the mixed experience, I probably wouldn't revisit The Salt Lick. You could eat very merrily with just street food in Austin (the BBQ joints were all trailers, and tacos are easy to score on the street), but sometimes it’s nice to just sit down, kick back and be served. I was knocked out by the quality of the spots I list below, which comfortably hold their own against anywhere internationally. This was my last meal in Austin and one of the best bang for the buck deals in town. On a Monday night, Gardner has a great value four course set menu at $28 (there’s a couple of supplements which can bump the price up a bit more, but let’s not quibble over a few bucks). 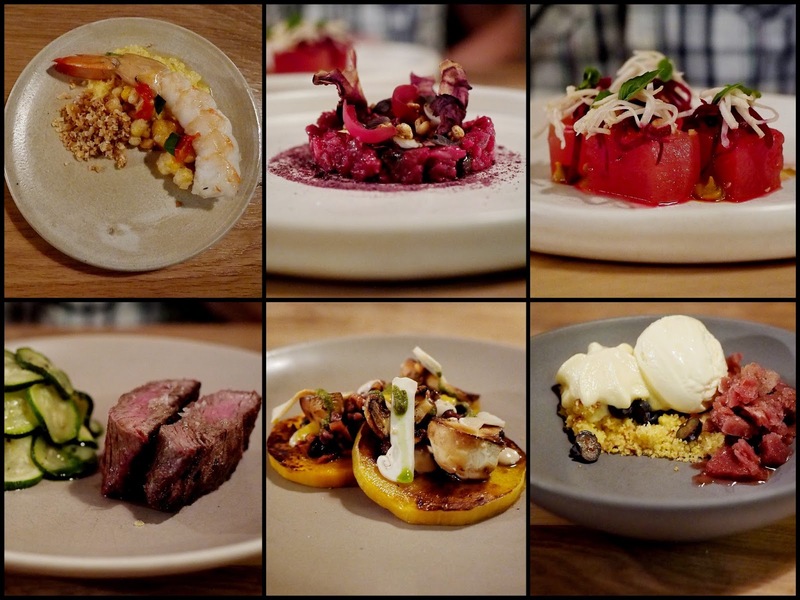 Dishes included juicy shrimp with corn, chicken skin and peppers, a beef tartare with red cabbage, toasted grains and shiso, a refreshing watermelon with celery root, fermented peanut and beet as well as butternut squash with matsutake mushrooms, pine & huckleberry. Desserts were on point too, with the chocolate, buttermilk, sesame and almond combination, pictured below, a favourite. It’s a well judged and sized menu with interesting preparations and terrific presentation. I enjoyed Gardner a lot. The chef at Qui is a bit of a celeb, with appearances on the US show Top Chef. Having not seen the US version of this show, the only credential I cared about was if he could cook. And cook he can, although I only tried (most of) the patio menu (Pulutan), not the tasting menu available inside the restaurant. I couldn’t fault the dishes we had. From the tacos to the “ceviche”, to tender pork skewers, the squid adobo and the peanut curry (kare kare) with Filipino influences, I enjoyed it all. 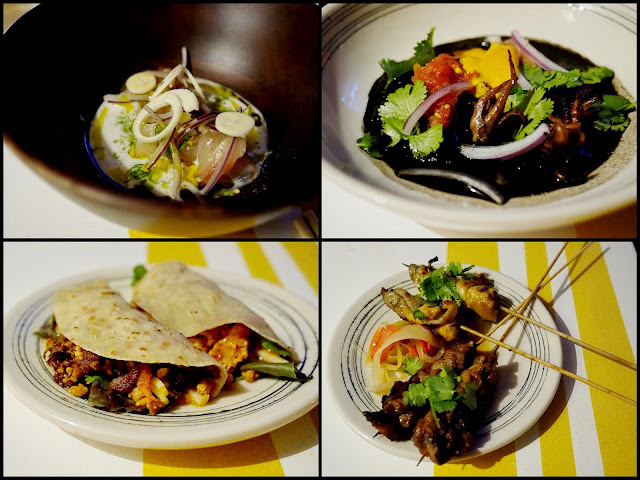 I'm guessing Qui is quite unique in Austin, with its take on Asian flavours but with a local slant. The must have dessert is the cheddar cheese ice cream sandwich. The ice cream is wedged between two crispy waffles and topped with shavings of cheese. It’s a curious combination of savoury and sweet that works. Service at Qui was great (like everywhere in Austin to be honest) and the cocktail list was very tempting. I liked the relaxed vibe and the food at Qui a lot, making it my favourite eat in Austin. Dai Due is my kind of place, and is very Austin. It champions local produce, even down to the wines (for better or worse), and is a nose to tail kind of spot. They bring in their own animals, breaking them down for sale in the butcher shop/deli at the front of the venue, and serving them in the restaurant too. A lot of the meat is cooked over wood on grills like you'll find at Asador Etxebarri near Bilbao. The passion for quality is obvious. I planned my Dai Due visit to coincide with the Sunday night supper club when fried chicken is on offer. Our helpful waiter suggested that since the supper club menu (chicken, dessert, coffee) is pretty substantial, we should share that and order a few dishes from the a la carte menu to round things out. The chicken was super crispy and juicy, without any trace of greasiness. It’s cooked in a mix of tallow and lard – byproducts of the carcasses I referred to above. The chicken is definitely finger lickin' but I would have liked it more with a more seasoned coating. At Root & Bone in NYC, which is my gold-standard when it comes to fried chicken, you'll find a little lemon zest added which brings the dish to life. We also shared some well cooked blue crab cakes with a basil mayo and pickled corn and finished off with an apple pie served with Mexican cinnamon cream. The pastry was made with lard, again showing the respect for the whole animal. For me, the downside of the hyper-local focus is the lack of variety on the wine list. Dai Due has no licence to sell spirits either, so don’t plan on cocktails. There’s an extensive beer menu though, which seems a more apt accompaniment to the fried chicken anyway. Given its reputation for great Mexican food, I really didn’t eat enough tacos in Austin. However, I loved the ones I did get to eat. My first stop in Austin was a food truck on East Chavez. It was hot and humid, even at 10pm, but the chilli heat from the condiments seemed to help a bit, or perhaps the flavours just distracted me from the oppressiveness of the weather (living in London all these years, I’ve lost my Australian ability to deal with heat). For $1.50 each (a bit more for the crispy fried tripe bites), you could not ask for anything more. I really liked the fresh corn tortillas and the punchy flavour of the sauces. Bomb Tacos is also a must-visit because it reflects the microcosm that is Austin. Bomb is located at the back of The White Horse, past the crowds of folks two stepping to live music and the blokes jamming with an accordion and playing the spoons in the small patio area. You could interpret this as either peak hipster or an everyday Austin occurrence (I went with the latter). I only took a dodgy photo of the glorious fish taco at Bomb. Imagine crispy fish, a soft tortilla, spicy sauce plus cold beer and you get the picture. You may be asked to indulge a partner in a little two step to the country music kicking off inside, but consider it as a condiment or little bonus. Make sure you take your ID with you if you look anything younger than 50. Breakfast tacos are a big deal in Austin, especially if you’ve hit the town the night before, and Tamale Houst East is a bit of an institution. Walk in, order your taco, grab a number but before taking a seat swing by the condiments fridge and pick up the green sauce. It'll really give your morning tastebuds a kick. We ordered a variety of stuff, but I really liked the taco with black beans, avocado, bacon and cheese. You can't beat their migas either. If you’ve never visited Texas, then something kitsch like a Texas-shaped waffle has got to be good. I saw this on the instagram feed of the chef Bo Bech, who is the man behind Geist in Copenhagen (by the way, you can see my list of top Copenhagen tips here). The pecan maple waffles at 1886 were not too sweet, and the addition of fruit takes the edge off the maple. 1886 is in the lobby of the very classic Driskill hotel and is worth a visit.